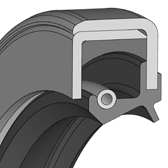 The WCS is a single-action rotary shaft seal for rotating or pivoting shafts with optional protective lip sealing ­action (WCS) on the side facing away from the medium, against dirt accumulation from the outside. The additional metal insert gives the rotary shaft seal more rigidity and the metal outer casing guarantees tight and accurate fitting. 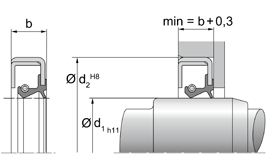 The WB model has limited sealing action with thin fluid or gaseous media and with split housings. To guarantee a high degree of static sealing on the outer surface, better surface treatment of the housing bore is required or an additional coat of paint should be applied to the metal outer casing. The nominal widths mentioned on the following pages represent the standard dimensions. They are generally in stock or can be delivered at short notice. Other dimensions and different designs, e.g. double dust protection lip, spiral on the sealing lip, spring or metal insert made of other steel grades can be produced as well as all kinds of special designs. WC/WCS are available with an additional coat of paint. Minimum quantities may be obligatory for dimensions outside of the standard. Areas of application: Heavy engineering, e.g. agricultural and forestry machinery, wind energy converters and rolling mills. As a result of its greater rigidity the WC/WCS is particularly suitable for larger dimensions as well as difficult installation conditions and severe operating conditions.